PMI has developed various amplifiers for a specific application or to perform a special function. A few of these products are listed below. If you require a special function amplifier, please contact us to discuss your requirement. This amplifier was designed to support TWT manufactures and their need for custom SSPA's. One standard model is listed below, but we can build these to meet your custom requirement. PET Model No. 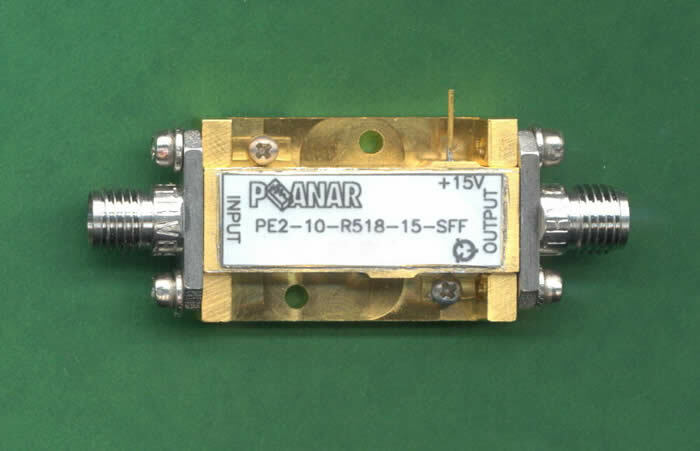 PEC-35-614R5-VGC-SSPA provides 30 to 37dB of gain from 5.85 to 14.5GHz. The power output at 1dB compression is greater than 22dBm and 2nd harmonics are internally filtered to provide more than -30dBc rejection. An integrated linearized analog attenuator provides up to 35dB of gain control. Additional RF input and output ports are provided such that an external power linearizer can be installed in the system. This amplifier operates over the 500MHz to 18.0GHz frequency band and offers a positive gain slope. This amplifier is useful when trying to correct for a gain loss due to long cable runs. Many options are available such as frequency range, gain levels and output power levels. Please contact us with your specific requirement. We can design the amplifier so that the gain curve matches your exact cable loss profile. This amplifier operates over the 20MHz to 1.0GHz frequency band and offers a positive gain slope. This amplifier is useful when trying to correct for a gain loss due to long cable runs. This model offers 6.9dB of gain at 20MHz and then slopes up to 19dB of gain at 1.0GHz. This model offers a very high OIP2 of greater than 50dBm while maintaining a low noise figure of 8.0dB typical. These are currently being used in airborne applications. Please contact us with your specific requirement. We can design the amplifier so that the gain curve matches your exact cable loss profile. This amplifier operates over the 14.0 to 16.0 frequency band. It provides a limited RF output and has a On / Off blanking feature. A TTL signal can select isolation (blanking) mode which provides greater than 60dB of attenuation. The attenuation switching speed is less than 10 nanoseconds. 18 @ TTL "0", < -40 @ TTL "1"
Switching Speed (Delay On + Ride Time): < 10nsec. RF Switch Attenuation Range: -60dB min. RF Minimum Pulse Width: 50nsec. This amplifier was designed to provide ultra-flat gain response from 5.6 to 8.4GHz. This amplifier provides 25dB of gain and a limited output power of 19dBm ±2dBm. This amplifier contains integrated low-pass filters to suppress 2nd harmonics while in a limiting condition. A BIT "TTL" circuit is incorporated on the output of the amplifier in order to monitor the amplifiers output power level. 2nd Harmonic Rejection: -40dBc min. Other frequency ranges and gain levels available. Click to view data sheet. This amplifier has a single input and two outputs that operate over the 6.0 to 18.0GHz frequency range. Output #1 provides 23 to 27dB of gain, while Output #2 provides 13 to 17dB of gain. The unit provides excellent gain flatness over the full bandwidth. No switching between outputs is required and both output ports are on simultaneously due to the integrated Wilkinson power divider. Other frequency ranges and gain levels are available. This amplifier was designed for the commercial fiber optic market. This fiber optic driver is priced very low when compared with other suppliers. All specifications are typical and subject to change with or without notice.